You are here: Home » Let’s Play Beer Detective: What Kind of Beer Did Obama Share with Dakota Meyer? 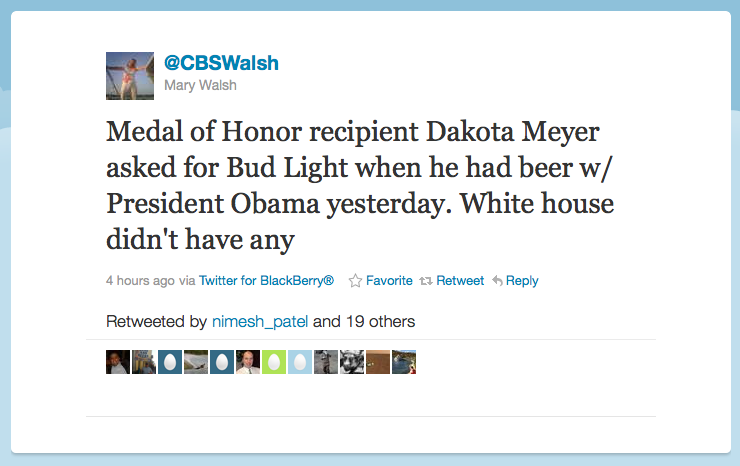 Let’s Play Beer Detective: What Kind of Beer Did Obama Share with Dakota Meyer? I’ll admit that this is a bit obsessive, but our reader Alex got the wheels turning in my head and now they won’t stop. I made a half-joking comment on the “Heroes get Beer” post that I hoped the beer Obama shared with Dakota Meyers was at least an Imperial Pilsner, and Alex said that was actually possible based on the lacing left on the glass. This got me to wondering what else we might be able to glean from the official White House photo, so I did what anyone with OCD and Photoshop would do and found the biggest image available online and enhanced it. First off, good call on the lacing, Alex. That’s definitely not a Bud and probably not a White House home brew (I recall hearing they have brewed their own in the past). The color lends itself to a lager or a pilsner, one that’s very clingy. Can anybody else tease any other clues from the picture above? Any guesses what the beer might be? Also, the beer you see is the one in front of the President. I chose it because the lacing was very clear on the top. Looking at it closely, I think it shows that our Commander in Chief likes his beer – that’s a pretty hearty first sip. Anything else jump out at you here (besides the fact that I need a life)? Update: Bud Light has been ruled out! I’m happy to know that the White House doesn’t serve that crap! Thanks to FatCatKC for the intel. ← Brew Tattoos: Passing Fancy or Bad Ink Trend? Isn’t the Commander in Chief a Yuengling fan? Looks like a lot of lacing, but it was just the first sip and maybe it got hit with too much CO2. Can’t we dream, Slouch? Can’t we dream? Besides, when they put them in there, they come right back as donations. It’s kinda like money laundering! My first thought was Yuengling. I thought he was a Goose Island fan? I’m hoping it’s at least something like that. He’s from Chicago, could be a Goose Island offering? For some reason when you said Imperial Pilsner I immediately thought of Joe’s Pilsner from Avery. That would be a ver good beer choice! Glad I could contribute an idea for a post! I’ll put on my detective hat and see what I can come up with. Thanks and thanks. Credit where credit is due! The Washington Post identifies the beer as an “ale.” So lager is out. Of course, they may just be using that as a generic term for beer. So, back to square one. The fact that Obama drank a Bud Light at the famous “Beer Summit” with Henry Louis Gates (Red Stripe) and Sgt. Joseph Crowley (Blue Moon), could cast some doubt on the 312 theory. Meyer requested Bud Light but the White House didn’t have any. Nice work FatCat!! I’ve tweeted the source of this info (Mary Walsh from CBS) for more info. Hopefully she’ll respond. Could certainly be a honey ale, and it’d be cool to say you’ve had it, befitting a MOH recipient. That would be the best possible answer to our mystery! Now I can move on with the rest of my day. I’ll write a post about this right now. Thanks so much for hooking us up with the info! Nice detective work! I’m very pleased with the answer. I feel exactly the same. Very cool.